Published reports attest to the high therapeutic effectiveness of various types of oils in various inflammatory processes. 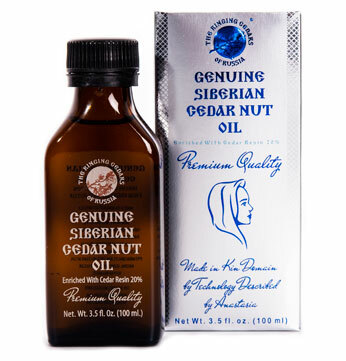 Cedar nut oil is distinguished from other well-known curative oils by its enriched content of various kinds of healing elements. It is a natural product used from ancient times in folk medicine. Cedar nut oil contains a large quantity of polyunsaturated fatty acids, including a significant quantity of fat-dissolving vitamins E and F, which are known for their high level of physiological and anti-acidic properties. The oil contains phosphatidic phosphorous, very important to bodily health, besides being a rich source of vitally important micro-elements: phoshporous, calcium, magnesium, manganese, copper, zinc, cobalt and iodine. Cedar oil contains up to 5% nitrogenous substances, of which 90% are amino acids, 70% of them indispenable acids - all of which testifies to its high physiological value. Clinical tests of cedar oil have been conducted on patients at the Tomsk Scientific Research Institute of Balneotherapy and Physiotherapy. The aims were: to demonstrate the healing effectiveness of a given drug in both internal and external applications through sonic phonophoresis, to determine the dynamics of subjective and objective indications, to study the influence of cedar oil on the nutritional, secretory and excretive functions of the stomach and liver, to study its anti-oxidant properties, to work out the methodology of application to treatment, to determine its level of tolerance by patients under various prescribed methodologies. 1. General clinical blood research (aspartate aminotransferase, alanine-aminotransferase, alkaline phosphatase, antioxidant activity, methane-dicarbonic dialdehyde). 3. Follicle-stimulating hormone with targeted biopsy. 4. Duodenal intubation with research into the chemical properties of bile. 5. Determination of the secretory function of the stomach. 6. Ultrasonic examination of the bladder, kidneys and pancreas. The study comprised 30 patients under observation. Of these 25 had chronic erosive ulcers of the gastric mucosa, duodenal ulcers with accompanying cholane giocholecystitis of opisthorchosis etiology; the remaining five had chronic cholecystitis with chronic gastritis with a reduced secretory stomach function. Two of the thirty subjects had reactive pancreatitis, while four had chronic hepatitis outside active procedures. With all 30 subject s motor dyskinesia of the bowels was observed. Subsequently the subjects were prescribed a programme of treatment: one teaspoon of cedar nut oil three times a day over a two-month period. As a result of this treatment stomach pains were completely eliminated in all patients. Symptoms of dyspeptic disorder (nausea, heartburn, regurgitation and vomiting) were not to be found in a single patient. In 28 of the subjects a normalisation of bowel functions took place. According to follicle-stimulating hormone tests conducted 20 days after the treatment, ten of the subjects had experienced full recovery from ulcers and gastritis along with a reduction in inflammation of gastric mucosa and duodenal ulcers, as well as a reduction in ulcer size for the remaining 15 patients with erosive mucous stomach ulcers. There was a 50% reduction in the number of cases of fixed duodenal reflexes, according to endoscopic and laboratory tests. In evaluating the laboratory tests there was an indication of some reduction of acidity in the stomach juices in subjects with previously high acidic levels. The quantity of bilious discharge from the gall bladder doubled. 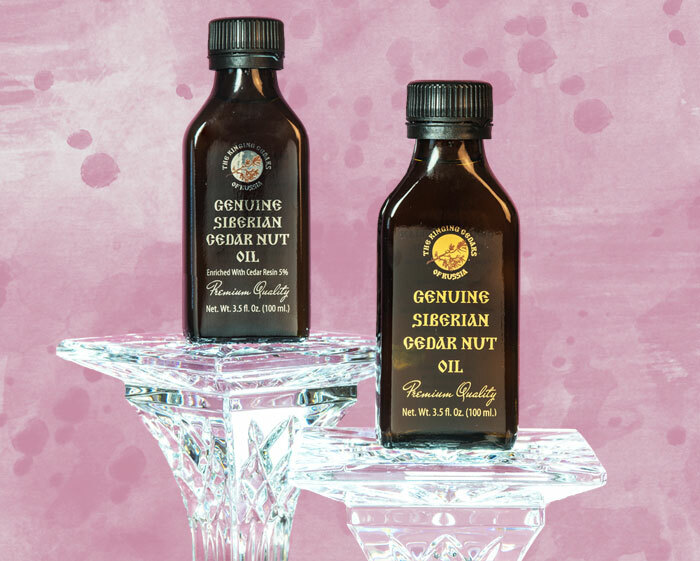 Thus, on the basis of the results obtained, one may conclude that cedar nut oil has a healing effect, meets a favourable reaction with patients, and can be applied to the treatment of digestive disorders. It is especially effective in curing erosive stomach and duodenal ulcers. During the remission stage one can apply phonophoresis of cedar nut oil to the projection area of the pathological process for a full and lasting hearling effect. When diluted with milk, the cedar nut oil has an anti-inflammation effect in treating cholecystitis and hepatocholecystitis. 1. Cedar oil is prescribed for 30 minutes or 1 hour before intake of food over a period of 21-24 days, with unhurried swallows of a teaspoon at a time three times a day. This is recommended for ulcerations located in the stomach or duodenum. 2. Cedar oil is prescribed for 1 hour before intake of food, diluted with milk (1 : 1) according to the method described above. This is recommended when ulceration is combined with chronic cholecystitis. 4. In the case of post-excision disorders on account of ulceration, the treatment method may also be applied to patients operated on for cancer of the stomach. 1. Patients with erosive ulcers of the stomach and duodenum. 2. Patients with cholecystitis and hepatocholecystitis. 3. Patients with endogastritis or bulbitis. 4. Patients with chronic pancreatitis. 5. Patients with post-excision discorders on account of ulceration. There are no known counter-indications to application. 1 In this case, M.D. indicates the Russian degree 'Candidate of Medical Sciences', while D.M.S. signifies the Russian degree 'Doctor of Medical Sciences'. Presented at the Tomsk Scientific Research Institute of balneology and physiotherapy of Ministry of Health of the Russian Federation, Tomsk, Russian Federation, November 15, 1995. http://niikf.tomsk.ru.